How Do I Make A Sewing Machine Quieter? Is your sewing machine making unwanted noise? Are you irritated with the shaking of the sewing machine? Well, you're not alone. There are many people who have a similar issue. 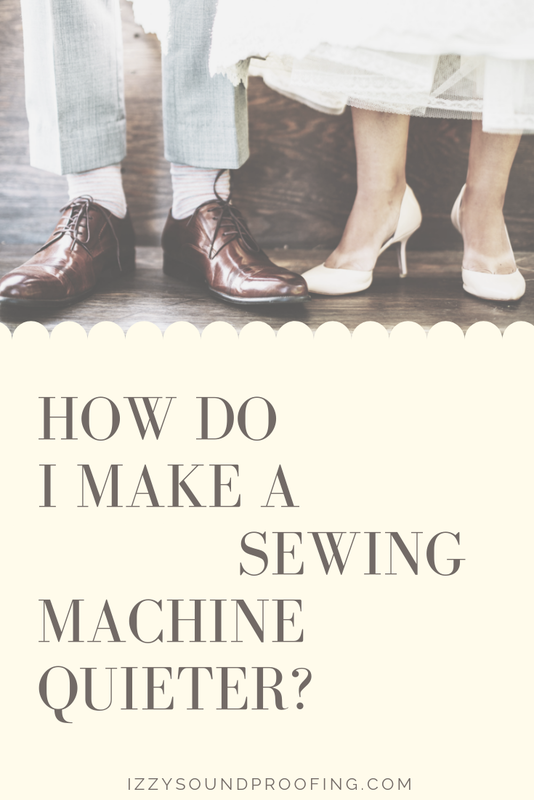 Today, I'll be sharing the step by step method that you can follow to make a sewing machine quiet? The steps are actionable and after implementing the below-mentioned steps, you will find a drastic reduction in the sewing machine noise, vibrations, and shaking. One of the prominent reason for shaking and unwanted noise is the unstable base of the sewing machine. The first and foremost thing that you need to do is to use a sewing machine vibration pad. It will absorb all the unwanted noise and vibrations that the sewing machine is making. There are quite a few vibration pads available on the market. I've tried a few of them, but when it comes to the recommendation, I'm very peculiar about the product. If the sewing machine is not balanced, then the outcome of the vibration pads will not be optimum. You need to do two things to check the balance of the sewing machine. Flat Bottom Surface:- You need to check that the surface on which the sewing machine is placed is flat or not. If it is not flat, then you'll need to move the machine to a flat surface. Checking the Levellers:- You need to check whether the levelers are functioning properly or not. If you find any problem with the levelers, you need to immediately replace it with a new one. Once you've performed the aforementioned step, you need to check for the noise. If the sound still persists, then it is highly recommended to check and identify the source of the noise. For example, if the noise is coming from the gears, then you need to lubricate the gear on a regular basis. How often you clean your machine? Well, the question may sound surprising to you, but the reality is that a lot of people don't clean the sewing machine until they find some problem with the functionality. Correct me, if I'm wrong? As a soundproof consultant, I always advise my clients to clean the sewing machine at least monthly else there can be complication and issue with the functionality of the machine. While cleaning the sewing machine, you need to give preference to the troat machine which makes loads and loads of irritating noise if filled with dust and any other dirty substance. Maintenance not only reduces the unwanted noise but also increases the longevity of the sewing machine. Check this guide on Amazon. Trust me, you'll never regret. It's worth every penny spent. I'm attaching a self-explanatory video for your perusal. You need a perfect table for your sewing machine. In case, you've placed the sewing machine on a plastic table, then you need to immediately replace the plastic table with a wooden one. Keep in mind, the place you've placed the sewing machine and the material on which you've placed the machine highly influence the noise made by the machine. The wooden table absorbs the noise whereas the plastic table deflects the noise. I'll advise you to change the location of the sewing machine, in case you've placed it in the long hall because changes of echoes, reverbs, and vibrations increase to a great extent. If you're using a sewing machine, then you must be aware of the fact that the spend of the machine varies as you vary the pressure on the sewing pedal. In short, the more pressure you'll put on the pedal the faster it will be. The best way to operate a sewing machine is to maintain a constant speed by placing constant pressure on the pedal. I'll not advise you to go for a new quieter sewing machine model until you've tried all the above steps. Secondly, if you're the machine is old, then try a new one is a better option because it has been found that the older machines are noisy. If you've got the budget, then nothing can be better than bringing a new sewing machine home. I hope you would have gained some insights from this post on "How to make a sewing machine quieter?". You need to follow all the steps for the optimum output. Feel free to contact me for any doubt or query. How to soundproof a TV room? Are noise canceling headphone safe?